Fall is here for sure. 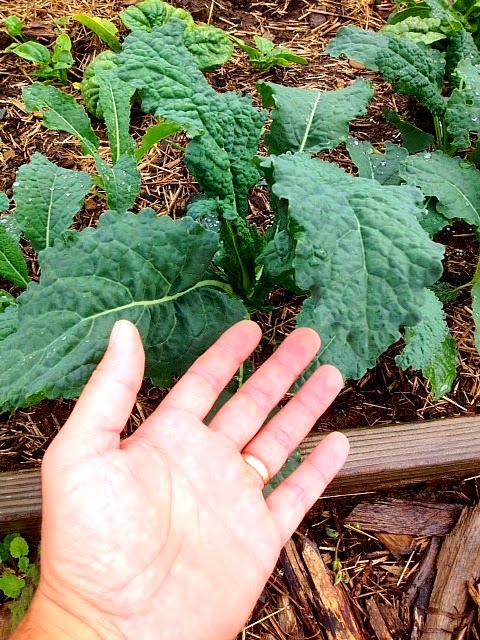 We have our first harvest of autumn Lacinato Kale (a.k.a. 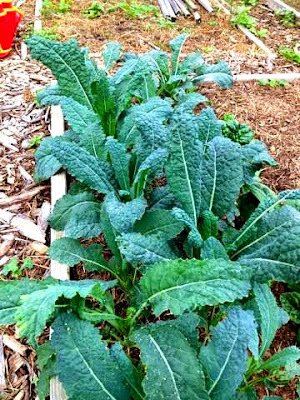 Dinosaur Kale or Cavolo Nero) at the MCG! 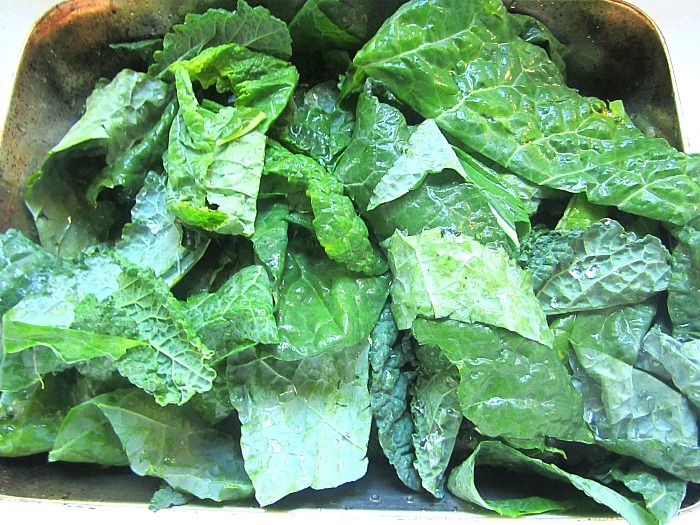 I have a whole bunch of kale recipes ready to go! Last winter, I ordered this dish at one of my favorite little Cantinas in the West Village, and it stuck in my mind. It was time for me to recreate it at home. They called it a "farroto", sort of a like a risotto, but made with the Italian grain farro, instead of rice. If I may so bold as to say that this came out even better than their version! There are a few steps to making this dish, but you can get everything ready before hand, so all you have to really do is stir the farro. If you can't find speck (smoked prosciutto), then use bacon, but Trader Joe's now sells it. It's worth the effort, this was excellent and is now on my menu! Get everything ready before hand. Mise en place. 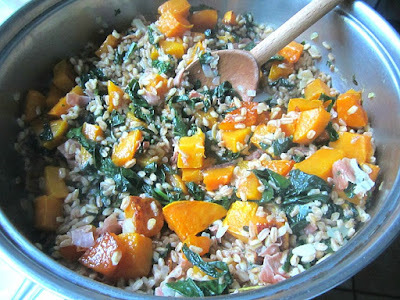 You will need 3 pans, one large deep skillet for the farroto, one small skillet and one sheet pan for the squash. Sorry. Start by roasting the butternut squash. Lay out the diced squash on a foil lined baking sheet (easy cleanup). Drizzle with olive oil and kosher salt. Roast in a 400F oven for 25 minutes or so. Turn once, so the squash doesn't stick to the foil. Set aside. 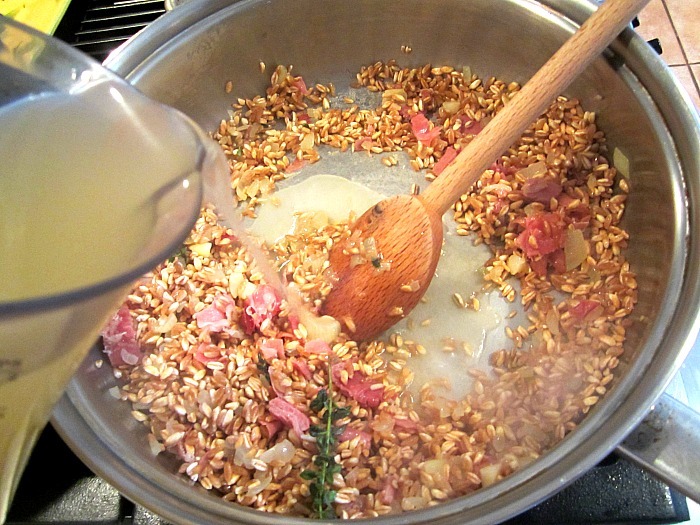 In a large saucepan, soak the farro for about 30 minutes with just enough water to cover. 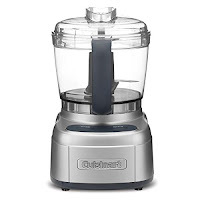 This softens the farro and speeds up the cooking process. Next step: slice the center ribs out of the kale, by folding the leaves in half and cutting down the middle to remove center stems. Then slice into ribbons. 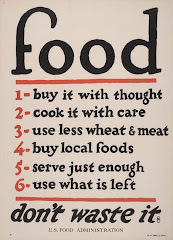 You can do all of this while your farro is soaking. 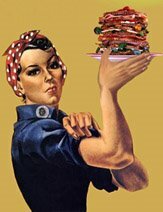 Set the kale aside. In the small skillet, heat some olive oil and cook the onion thyme and garlic until translucent. 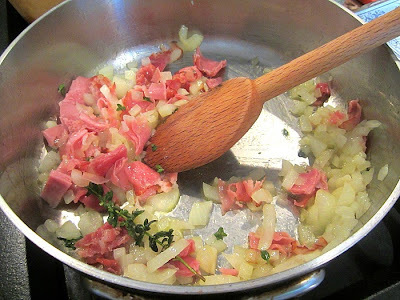 Add in the chopped speck and cook 2 minutes. Drain the water from the farro and add in the cooked onion, garlic and speck to the big skillet with the farro. 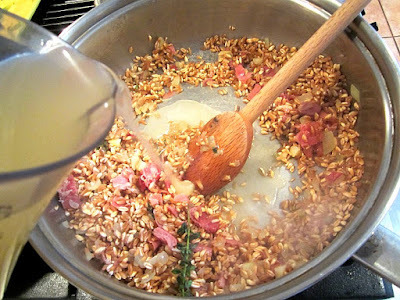 Turn the heat on high and cook the farro for a minute or two to toast with the onion. Slowly, add in 2 cups of the heated chicken broth and bring to a boil. Turn down the heat and simmer for about 12 minutes, until most of the liquid is absorbed. Keep stirring all the while, like you would a risotto. Now add in the last cup of hot stock (broth) and add in the kale. Simmer again until the kale is soft and the liquid is absorbed, about 12 minutes. 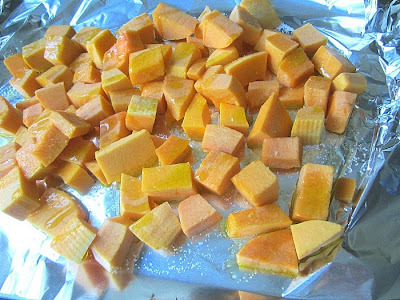 Fold in the roasted squash during the last minute and add the lemon zest and tablespoon of honey. No butter is needed here, and no salt or pepper. The flavors will be rich and salty enough from the smoked ham and the sweet butternut squash. Total cooking time is about 30 minutes, and the farro should have a nice bite. 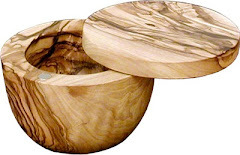 Serve with a nice crisp white wine and enjoy! I never know what to do with kale, so thank you for this recipe! 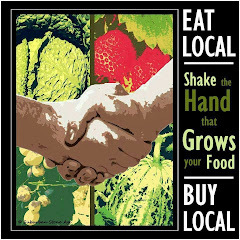 Love kale, although the one I buy at the market looks a bit different than the one you have here. I assume they taste the same? Question: I always have a hard time dicing up the butternut squash. Is there an easy way to do it? 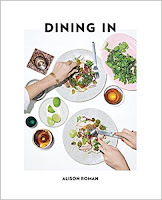 I plan on trying this on my family this week - it looks delicious! I've never made farotto, but this gives me the urge to try. The combo of lacinato kale and butternut squash is dynamite. My favorite 2 things butternut squash and kale. 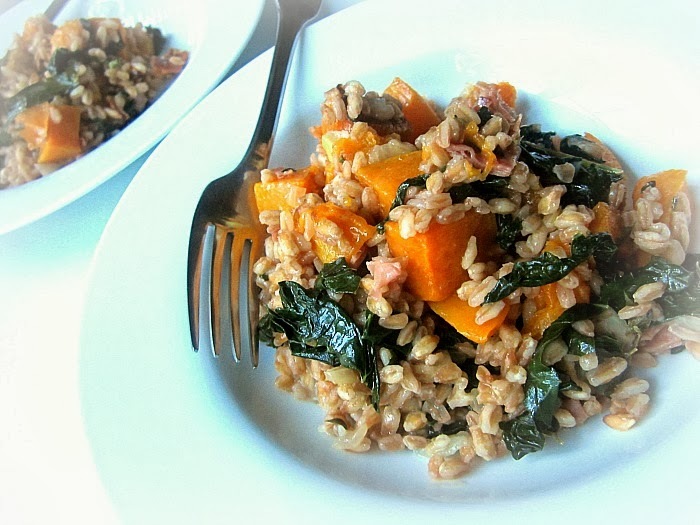 I will try this with farro for sure! I have never had a barley risotto, so can't advise! It probably be fine, but try and find some Umbrian or Abruzzese farro, it's so good, chewy and wonderful. I have got to plant kale next spring. In addition to the health benefits, I love the leaves! Made this tonight. Very delicious. Rarely has a (semi) Meatless Monday gone over so well with my 14-year-old twins. Thanks for the recipe!